Google and Apple have now released their latest 3D map offerings for the iOS market. Both Google Earth and Apple Maps now provide competing auto-generated imagery for a number of major US cities. Apple's new Maps introduces a fresh user interface for navigating a 3D city and from a commercial real estate perspective, Apple provides higher quality building imagery than what is currently available with Google's auto-generated, mesh-based, 3D buildings. Below are examples of the difference in building imagery quality between Google Earth and Apple Maps on the new iPad. 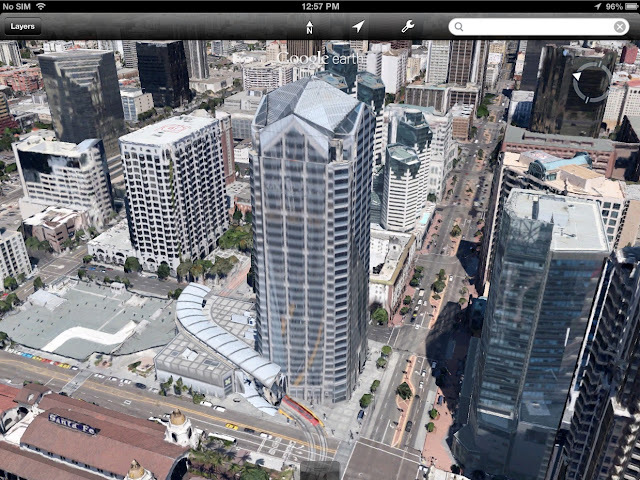 Note that Google's 3D buildings appear the same on the Android version of Google Earth as they do on iOS. Apple's Maps do not currently allow users to load any external data. This means that only content provided by Apple can be viewed on the map. Currently this is limited to location information provided by Yelp and vehicle traffic data. The latest version of Google Earth for iPad does allow users to load external data, enabling use with a platform like Cube Cities. Below is an example of how Cube Cities can visualize building data for an office property downtown San Diego, on iPad. As Google and Apple add 3D city coverage to their mobile maps the fidelity of both services will likely improve. At present, Google Earth for iPad (using external data from Cube Cities) is a more effective tool for analyzing commercial real estate, however Apple's building imagery is generally higher quality and available in more cities. New York and Chicago are noticeably missing on Google Earth for iPad but are available in 3D with Apple Maps.